Urban Simplicity: Angels are real! You may have seen or heard about these angels, but before I discuss them I have to mention a brief conversation I had with someone a few years ago. I was talking to someone I worked with at the time who openly spoke of communicating with her guardian angels. Yes, plural. I mentioned to her that I thought that I may have guardian angel because of certain circumstances I had been through in my life. Without missing so much as a breath she replied, "What, do you think you're special? Of course you do. We all do." 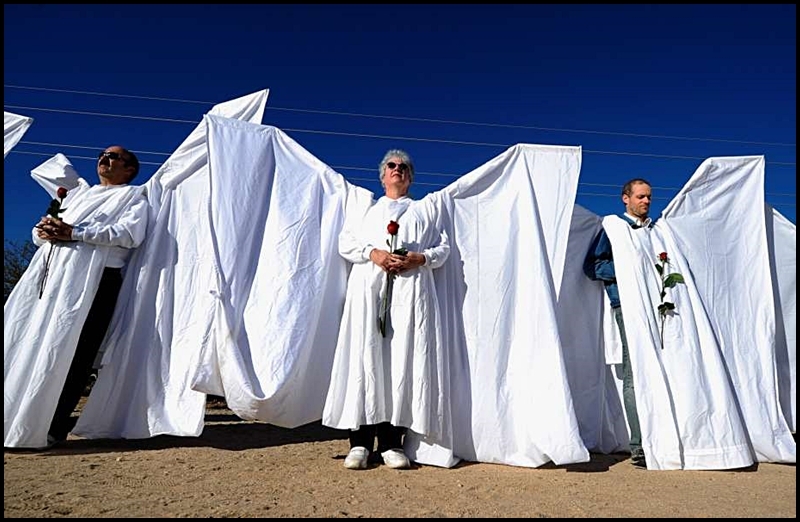 This said, these images are of real angels in my opinion...people donning wings to shield families and mourners of the dead in Orlando so they can grieve in peace. But who are they being shielded from, you may ask? That evil organization that calls themselves a church but goes around the country tormenting people at funerals. Their name shan't be glorified by mentioning it here. 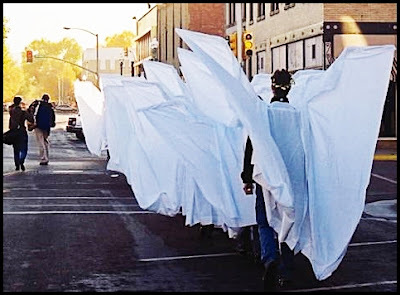 The Angels Action Project began in Laramie Wyoming back in 1999 to protect family and friends at the funeral of Matthew Shephard. Since then they've provided support at multiple services. They even offer a free PDF file on how to build angel wings. At the Orlando services the angels are a result of a collaborative effort from the Orlando Shakespeare Theater and others in the theatrical community. Sometimes I really do believe that I have a guardian angel. But when I see this I know that the people that perished, and their friends and families do. Angels in the flesh. Humans being kind to other humans. This, to me is beautiful. And I can say without exaggeration it brings tears to my eyes. In all circumstances we have a choice to how we want to feel and think. And there is always the choice between love and hate. I choose love.